by Pope Francis with Dominique Wolton. St. Martin’s Press (New York, 2018). by Pope Francis with Antonio Spadaro. “A Future of Faith: The Path of Change in Politics and Society” presents his dialogue with Dominique Wolton, a French reporter and sociologist. Their 12 conversations range across such compelling topics as globalization, immigration and poverty. Pope Francis’ well-known compassion and concern for the poor and marginalized are often apparent in these pages. Throughout the book he comes across as an intelligent, wise and humble leader whose humanity is unmistakable. The book also includes excerpts from six of the pope’s major speeches since he was elected pope in March 2013. These are well chosen to flesh out the dialogues. All in all, “A Future of Faith” is an inspiring introduction to the pope’s mind and heart. Father Spadaro gives us a close-up view of the pope’s heartfelt ecumenism, recounting his interview with the pontiff just before his October 2016 visit to Sweden to participate in the ecumenical celebration of the Lutheran Reformation’s 500th anniversary. 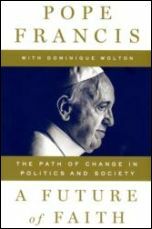 One of the most interesting sections presents Francis’ views on politics. In this highly polarized world, what is its proper role and value? The pope notes that what he calls “big politics … has been increasingly degraded into small politics.” But true politics is “craftsmanship used to build the unity of peoples and the unity of a people with all the diversity that is within them.” It is “one of the highest forms of charity” — and one that is helped by dialogue. “Open to God: Open to the World” also includes the pope’s recent speeches in Myanmar, Peru and Chile. I wanted to jump up and cheer when I read that Pope Francis had warned against the rigidity that prefers canon law to the gospel. I see appalling statements made about members of the LGTBI community by those who claim to follow the Christ, and wonder sometimes whether they ever read the gospels which shows him giving such acceptance to those who were marginalized by society in his time. And i loved Pope Francis’s statement that we are all refugees, pilgrim people on the way home.